Best Fishing Hooks | Which One To Choose? Fishing is a popular hobby that promotes patience and relaxation. It is a great way to have time to yourself, or spend time with family and friends. If you are new to the sport, you may not be familiar with the many varieties of fishing hooks available. There are multiple factors that go into choosing the best fishing hooks for your location, bait type and ultimately the fish you want to catch. 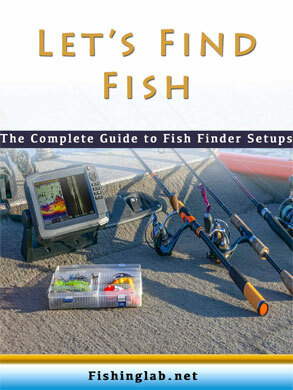 We can help guide you toward the size and style of hook you need to reel in your best catch. If you are going cat fishing, the JSHANMEI Octopus Circle Hooks are a great choice. They can be used in both freshwater and saltwater fishing and are designed to cause the least amount of damage by hooking a fish in the crook of the mouth.These strong and durable offset sport circle hooks resist corrosion due to their high carbon steel construction. They feature an offset point, special barb hooks and a circle hook design for decreased mortality rate in catches. The closed eye design with pronounced circular bend, inward bending point and short shank allow you to hook, and keep, more fish. As with all JSHANMEI products, they are trusted for reliability, durability and strength. The reusable plastic case is perfect for carrying in a backpack or tackle box. The set includes 25 hooks of each of six different sizes: #1, 1/0, 2/0, 3/0, 4/0, 5/0. Bass fishing most commonly uses Senko lightweight plastic worms as bait. The Sougayilang jig hooks are a great tool for this type of fishing. Featuring a 90 degree bend at the jig to keep a soft worm in place and avoid slipping down the shank. The specially designed barb will lock fish on the line, and prevent them from jumping off while running. Offset point design increases the likelihood that the hook with penetrate the skin as it is pulled out of mouth of the fish. The nickel plated high carbon steel construction will resist rusting and stay sharp throughout repeated uses. The extra wide gap and offset point provide strength and durability even for the largest fish. The value in these hooks comes from their high quality construction and affordability. Easily pack this small box of hooks in your pocket without needing to take a full tackle box. The compact package includes 50 hooks, with 10 for each size: 2#, 1# ,1/0, 2/0, 3/0. Bass fishing requires hooks with a wide gap to allow enough space for the fish’s mouth to catch. These hooks will provide the gap you need while accepting Senko worms to attract the fish. They are made with high carbon steel that is cold-forged and undergoes a heat-treating process resulting in the perfect level of flexibility to avoid breaking. Ranging in thickness from 1.25 mm to 1.8 mm these hooks are sturdy and feature a very sharp needle point. JSHANMEI products are quality tested in the field to ensure that these hooks will compete with other top brands. You cannot go wrong when choosing great quality and a great price. The set includes 25 hooks of each of six different sizes: #1, 1/0, 2/0, 3/0, 4/0, 5/0. Hooks are red, black or tea colored. Snelling your hook can require a lot of time and patience. These live bait J-hooks come snelled for quick use. From end to end these leaders are approximately 8.7 inches. Add a sinker to the main line and these hooks are ready to reel in catfish, kingfish and porgy. The green strand wire and haywire twist attachment provide maximum strength. You will not have to worry about a large fishing break your line with this quality leader. The strong hook with rolled-in point will make it easy to set the hook deeply without exerting additional pressure. The tough barb will keep bait and fish from getting off the hook before you are ready. For ease of use and high quality construction these leaders provide a great value. Available in various sizes: #2, 3/0, 5/0, and 6/0. Worm hooks are built sturdy to withstand the heavy fighting of bass fish. The closed eye on these straight shank worm hooks are easy to attach to a line using any knot. The 90 degree jig in the shank will keep your worms exactly where you need them. Featuring a very sharp barb and needle point, these hooks will be great for catching largemouth or smallmouth bass, redfish and speckled trout. This versatile hook can be used in Texas rig fishing to cover the needle point while dragging heavy vegetation in search of bass. We would not recommend using j-hooks for catch and release fishing. Excess damage can be done if a fish is snagged in the gills or if a j-hook is swallowed. Carrying case is clearly labeled on the lid so that you can easily choose the right sized hook. The box includes 10 hooks of each of five different sizes: 1/0, 2/0, 3/0, 4/0, 5/0. Keep your tackle box fully stocked with these practical and simple hooks. This large quantity of hooks will allow you to focus on fishing, not your equipment. Made with high quality carbon steel this set of 500 hooks is corrosion resistant. The wide bend of the circle hook allows for a more aggressive hook set. The needle point with barb is very sharp and durable. Suitable for use in saltwater or freshwater fishing. Hook sizes are small and best used for bluegill, sunfish and similar species. The small case makes this set of hooks easy to carry. The box includes 60 hooks of each of sizes: #3, #4, #5, #6, #7, and 40 hooks of each sizes: #8, #9, #10, #11, #12. You will have an easy time catching bluegill and sunfish using these small freshwater circle hooks. The high quality steel is strong and designed to last. Featuring a rolled-in point to set the hook deeply with reduced pressure. The box includes 60 hooks of each of sizes: #3, #4, #5, #6, #7, and 40 hooks of each sizes: #8, #9, #10, #11, #12. Your hook choice depends on your bait, the type of fish you are hoping to catch and many other factors. Size matters, and a smaller hook will likely help you catch a variety of fish. A #5 hook can catch a fish up to 25 pounds. Hooks with a short shanks are best used when strength is needed. These are designed to be durable and withstand breaking from snags. A hook with a long shank makes removal easier, especially with small fish. A long shank will prevent the fish from swallowing the hook and doing internal damage. Straight J-hooks should be used in active fishing, as you will need to set the hook when a fish bites. For more relaxing and social fishing, circle hooks will be your best bet. You cannot set set the hook using this type of hook, fish will be caught in the side of the mouth when they turn to swim away. To the amateur angler, hooks might all look the same: curved metal with a pointed tip. To the experienced fisherman, there are my more distinctions that make for the fishing hook. It is important to understand the types and uses of the right fishing hook for your catch. J-hooks look like a standard hook and are very hard, enabling them to pierce the mouth of large fish. They have a short, straight shank with a round bend and very long point. A circle hook curves back into a circular shape allowing it to only hook onto an exposed surface. Jig hooks are hooks that have been molded with lead or another heavy metal. They look similar to worm hooks with a molded collar above the jig to hold plastic worms in place. There are additional styles of hooks available, each serving a different purpose. For the best results, you need to match the size of your hook to your bait choice as well as the type of fish you are looking to catch. This can be a confusion concept as hooks are described in both sizes and aughts. The smaller the hook, the larger the number. The smallest hook is a #32 moving up in size until a #1. Larger hooks use a 0, or aught, to note the size. These sizes start at 1/0 and continue to get larger until reaching the biggest hook, a 20/0. Other hook measurements include the gauge or thickness, the length of the shank and the width of the gap. 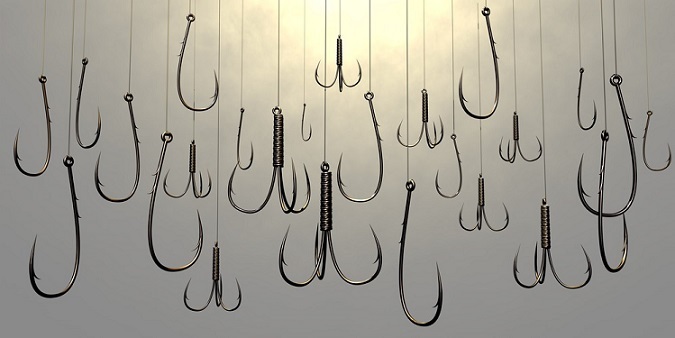 Now that you are familiar with types and sizes of hooks, we can start to understand the uses of each type. J-hooks were designed for saltwater fishing and are great for salmon and other species of jumping fish. Circle hooks are best used for bottom fishing or trolling, as they are less likely than a J-hook to get snagged. There are fewer gut-hooked fish using circle hooks, which make them a better choice for catch and release fishing. Jig hooks with long shanks are meant for plastic worms and are great for bass fishing. A shorter shank is best for live bait such as minnows. With the mix of metals in these hooks, you will see them in a variety of colors such as black, red, bronze and gold. Some days, fish just do not bite, and all attempts to lure them in fail. While we cannot promise that the fishing hook will get the job done on every single cast, we can recommend buying a box with a variety of sizes. You do not want to limit your options by having only large or small hooks.